The fascia has a crucial role in supporting the tiles in the bottom row of your roof and carrying the eavestrough while the soffit provide ventilation in the roof area, preventing you from the danger of timber decay. These two parts are very important for your house because they support the building and your comfort. If you are building a new house or renovating the existing one, Gut-R-Dun can provide you with high-quality aluminum soffit and fascia installation services. We are experts in our line of work and we don’t cut corners because we value quality too much. Our expertise has led us to the conclusion that high-quality soffit and fascia are of tremendous importance for your house. 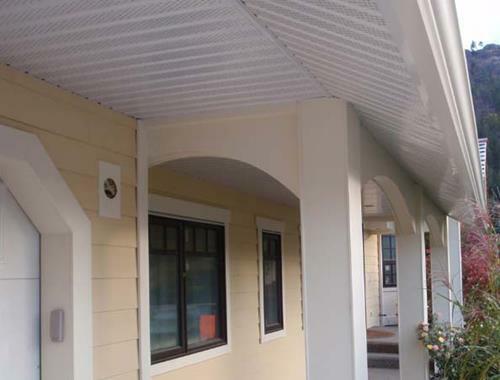 One of the great advantages of aluminum soffit and fascia is that they are cost effective and durable. They represent a low maintenance solution to a problem area, and they do not deteriorate over time as much as other materials. Aluminum fascia and soffit systems are non-corrosive due to aluminum’s amazing properties. They are also a weatherproof efficient solution that will save you time, effort and money in the future. If you live in Kelowna or Vernon, then we have great news for you. Gut-R-Dun is here to help you with your fascia and soffit system offering you the highest level of quality. We work only with premium suppliers, and we have a passion for excellence. Our experts are people who take pride in a job well done, so we try to become better and better every day and bring perfection to our clients’ houses. Our aluminum soffit and fascia systems are carefully selected so that our customers get the beauty and quality they deserve. As a token of our professionalism, we are offering you free expertise. We will come to your house and provide you with a quote for the job without any obligation from your side.